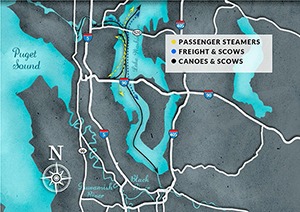 From canoes to cars, how have people moved through the SR 520 corridor over time? Why did Native communities call the Montlake Portage sxwacəgwiɫ (“carry a canoe”)? Why is there a park and boulevard alongside the highway in Seattle? What did community activists have to do with the “ramps to nowhere” in Union Bay? The lesson plans developed for this website will help students answer questions like these by exploring how communities in the SR 520 corridor region have been shaped by their environment and how those communities have utilized and altered that landscape to fit their needs. The History, Geography, and Civics lesson plans are aligned with state standards for those subject areas, for reading and for environmental and sustainability education. The lessons have primary and secondary sources, guiding questions for discussions and classroom activities, and include ideas for classroom based assessment (CBA) activities. The lessons are targeted at grades 3/4 and 7/8, when students are learning about Washington state history, but they can be easily adapted for other grades.